How much does it cost to stay overnight in Vegas Hotel and Casino? If you love gambling, there’s no better place in the world to go than Las Vegas. 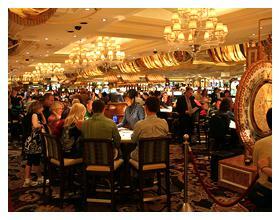 Whether you’re into poker, slots, blackjack, roulette or even sport betting, Las Vegas has it all. But where’s the best place to stay on your trip of a lifetime? If you really want to visit Las Vegas in style, the two top places to stay are the Aria Sky Suites ranging from $400 to $650 USD per night and the Skylofts at MGM Grand ranging from $850 to $1800 USD per night – they are pure luxury and the casino’s both hotels offer are top class, you also have the added bonus of maybe taking in a big time boxing match at the MGM Grand, usually home to Las Vegas’ top fights involving Floyd Mayweather and Manny Pacquiao. However, if you haven’t won the lottery or saved up your whole life to spend it all on a Vegas holiday, there are plenty of other more affordable options. The Bellagio comes in at $180 to $580 USD per night – and you’re likely to see Pokers top names in their well known high stakes poker room called Bobby’s Room, Phil Ivey is a somewhat regular visitor there. There’s also the Wynn Las Vegas, staying at the resort worth an estimated $2.7 billion will cost you between $190 and $550 USD per night – in terms of luxury staying at the Wynn probably offers the most value, everything about the resort is to the highest standards, the restaurant has a Michelin star while the hotel has a Five Diamonds award. Last but not least, if you want a nice hotel and casino on the lower end of the pricing stale, The Orleans Hotel and Casino is really worth checking out with prices ranging from $40 to $160 per night – this hotel is perfect if you want to avoid The Strip but it also has shuttle buses every 30 minutes if you want to get in, it has everything you need in a casino and holiday, especially if you’re a little older and don’t want to be party hard all night. Hoping a $40 a night hotel rooms doesn’t have any roaches or bugs… Hahaha! LOL Do you really think you’d even find a $40 room? At $40 a night I’d rather play from the comfort of my own home on the Palace of Chance site!